A joint review by Hannah Bond and Lucy Ayrton – Lucy’s comments in italics. It’s very easy, living in Oxford, to get stuck in a comforting cycle of visiting the same reliable restaurant haunts time and again because you know that you’re going to get a decent meal and that you’re facing nothing more than a ten-minute cycle journey home at the end of it. But that way stagnation lies! Who knows what you might be missing out on beyond the ring road? So I was very happy to journey to the almost comically picturesque Barford St Michael with Lucy one Saturday to give the food at The George Inn a try. The pub itself is lovely; a modern restaurant area at the back is perfectly pleasant, but we were very happy to be offered a big table at the front of the pub, in a pretty bay window next to the cheerily crackling fire. At this point – 1pm – we were literally the only people in the pub, which is always something that gives me pause. The menu we were given was different to what’s advertised on the pub’s website (and actually, we were quite happy to see this because, having had a look online beforehand, neither of us felt particularly inspired by what was on offer). That said, the menu we actually got was more of the same: quite standard pub food. Which is perfectly fine, if that’s what you’re in the mood for. Perhaps, we hoped, this would be standard pub food executed to a high level and thus completely delicious. Optimistic, we ordered. As the only representative of drinkers at a pub (Hannah was driving), I felt I should order a pint. There was a very decent selection of beers for a small pub, with about eight on including two interesting ciders (always a plus in my book). I went for a pint of Meantime London Lager, which was nice. Pricing was about level with what I’d expect to be charged in East Oxford, so perhaps a shade high for the location. 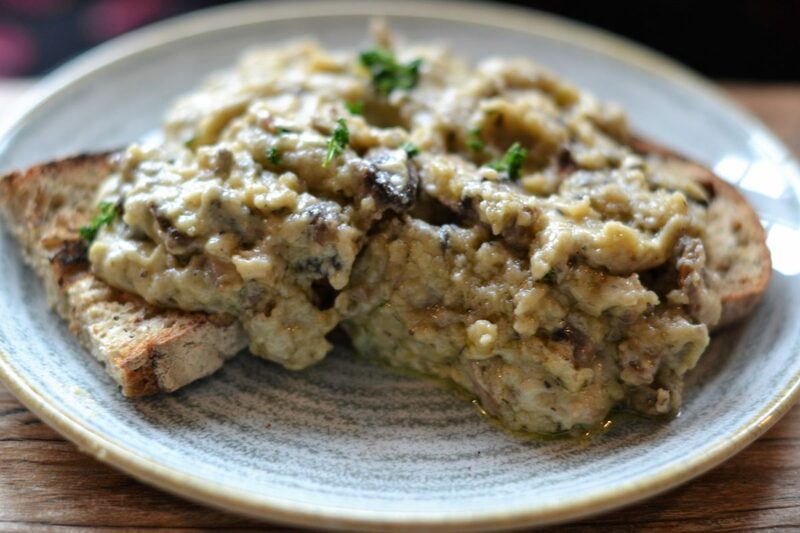 I started with the chicken liver pate and autumn chutney (£7), while Lucy – who, as a vegetarian, didn’t have a huge amount to choose from – went for the creamy garlic mushrooms and toast (£7). 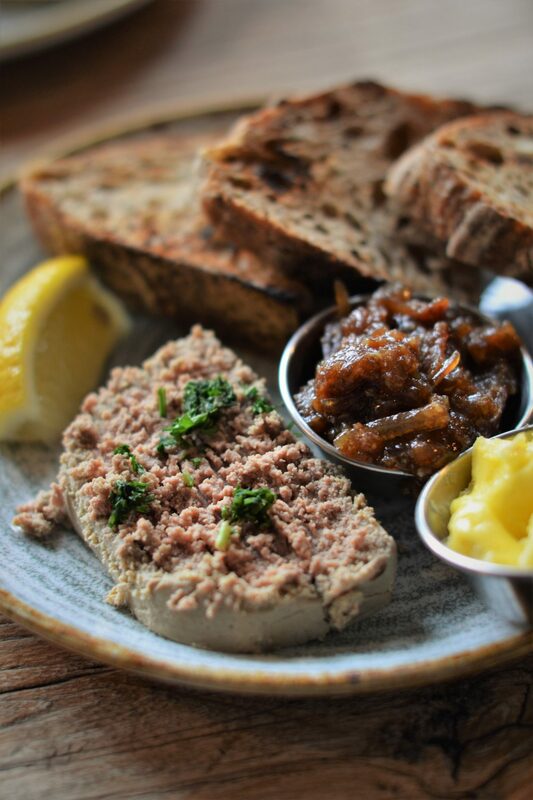 My starter was a hearty portion and actually really tasty; great fresh seeded bread with a generous slice of a rich pate and a well-balanced chutney to cut through the chicken liver. Nothing revolutionary but perfectly lovely to eat. The creamy garlic mushrooms were beyond hearty and verging into massive. Rather than what I had expected (a tangle of mushrooms, a dash of cream), I got a huge pile of mushrooms in a thick, heavy sauce. It was perfectly pleasant to eat, but not groundbreaking – exactly as Hannah’s it seems like. Unfortunately, after this encouraging start, the main courses were a bit of a let-down. 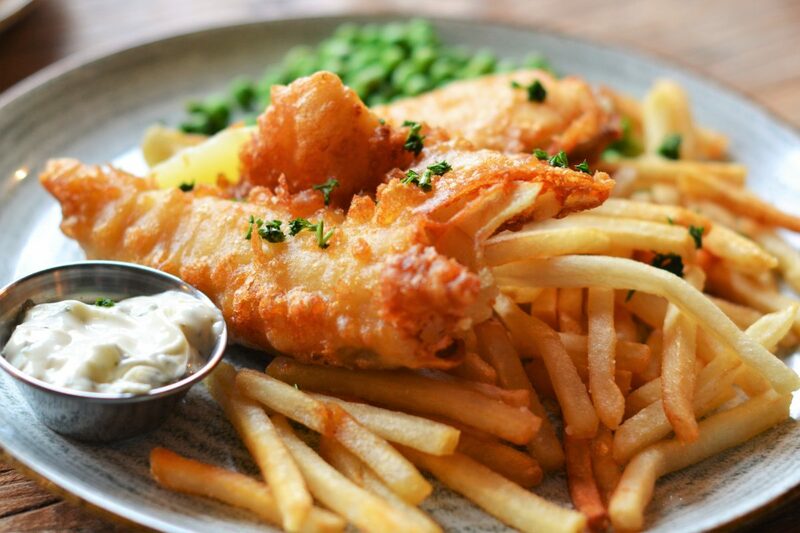 I chose the beer battered cod with chips, peas, and tartare sauce (£14) – partly because I think classic fish and chips is a great litmus test of pub food – while Lucy had the leek and cheddar tart with rocket and fries (£12). 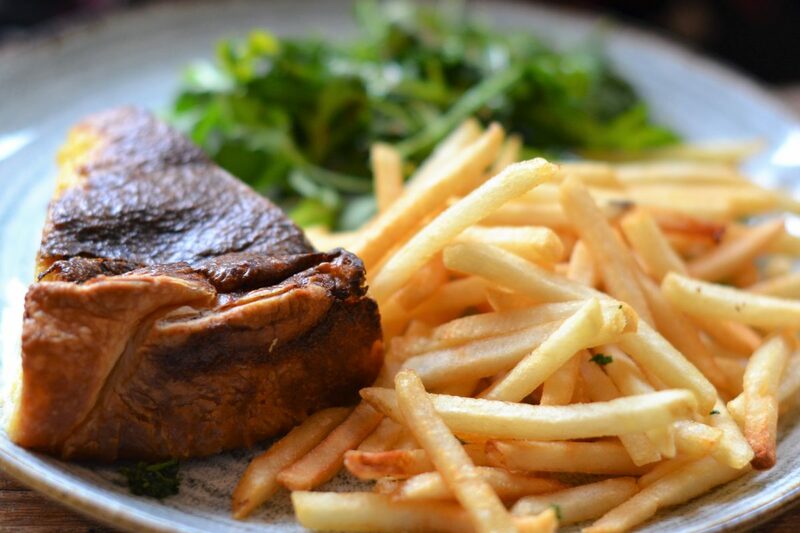 As a bit of a pedant – and a lover of chips – I was expecting the chips my meal was advertised as having to be those proper homemade chunky specimens, as opposed to what I actually got, which was a slightly anaemic pile of fries identical to Lucy’s. The batter on my fish was pleasingly crisp and the tartare sauce was perfectly decent, but that’s about as far as it went. Not a plate of fish and chips that will live long in the memory. As with the starter, what arrived was not exactly what I was expecting. I had imagined a tart to be a lighter kind of dish, all pastry shell and visible leeks with some cheese melted on top to finish it. What I got, I would describe as a massive cheese pie. There was a very high filling to pastry ratio, and the filling itself was quiche-like – like eating a wedge of baked cheesy scrambled eggs. This is not an unpleasant thing to be offered for lunch, but again, it was extremely heavy and not presented with a lot of flair. I second Hannah’s complaints about the chips, which were the only part of an otherwise very substantial meal that I would have liked to have been more hearty. Never one to say no when offered a dessert menu, I was very happy to leap on the sticky toffee pudding (£6), while Lucy chose the chocolate mousse with salted caramel (£6). 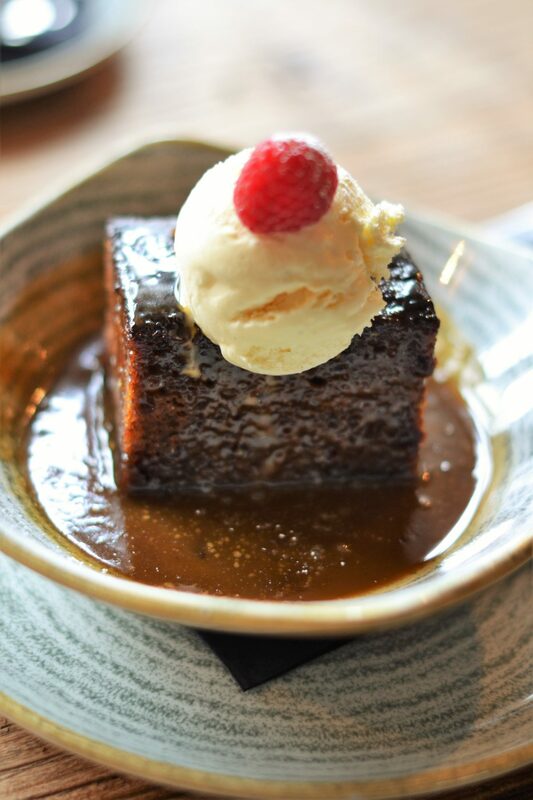 This was actually the best thing about my meal – a really lovely sticky toffee sponge with a generous amount of sauce that was, crucially, not sickeningly sweet, and a good quality ice cream. Even though I’d already had a generous amount of stodge at this point, I hoovered it up. 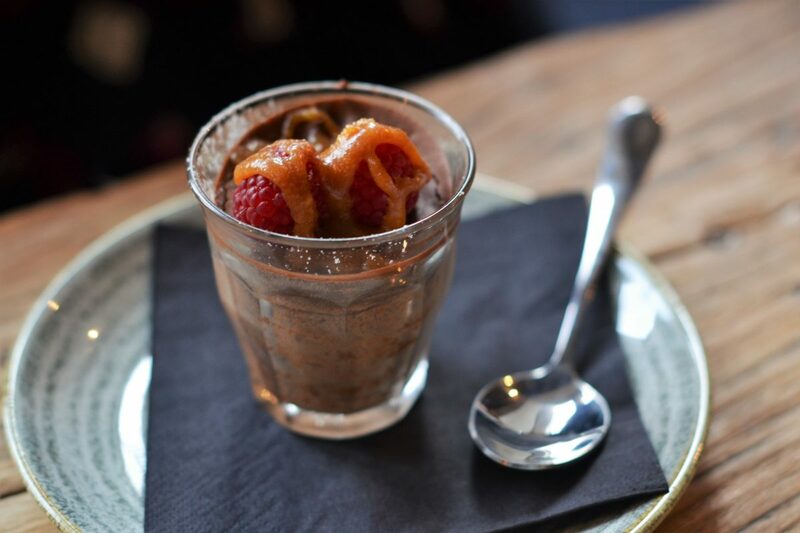 My mousse was what I’d describe as a chocolate pot – dense and very chocolatey. The actual mousse was very nice – thick and dark and delicious. The salted caramel was not within it but spooned on top, and seemed a little grainy. While the portion of the dessert was about right for after such a heavy meal, it struck me as a little small for the list price of £6, and if I’d ordered it as a snack alongside a coffee I would have been a bit disappointed. When I got back I described the meal to my father in law; always a man to appreciate a healthy portion, he thought everything sounded absolutely terrific. I think that after a long chilly walk around the countryside, with the expectation of a huge pub lunch, this would have been great. It’s also worth noting that the pub itself is great – the staff are friendly, there are llamas next to the car park, and it’s pretty and inviting. Overall, The George is a perfectly pleasant place for a pub lunch, but not a food destination. The atmosphere was welcoming, the service was friendly, and the pub itself was charming. If I lived in the village I’m sure I’d be there regularly; if I was driving by on the way to somewhere and needed to stop for food then I’d drop in; if you’re walking in the area and need something hearty and warming then it’s a good choice (they’re also very dog-friendly which is a big plus in my book!). But if you live in Oxford, don’t make a point of driving forty minutes to get there just for the food. There are pubs doing more interesting and high-quality fare much closer to home. 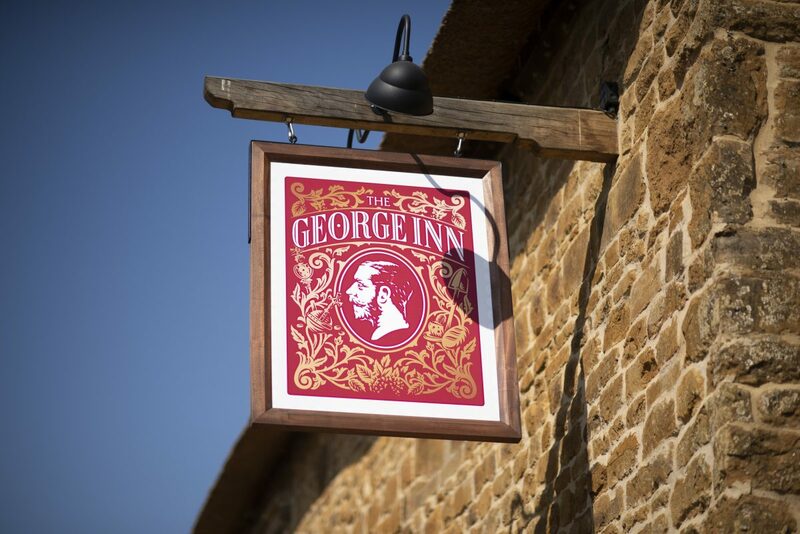 We dined as guests of The George Inn, all views are our own.